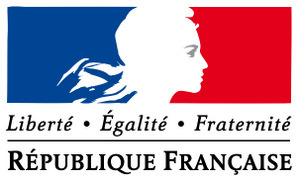 Usage notes: There were several contenders to the "motto of France" throne that arose during the French Revolution, but in 1958 Liberté, Égalité, Fraternité finally beat them all: it was added to the French constitution and became official – learn more. 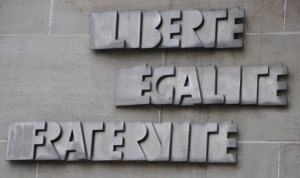 The French don’t normally walk around proclaiming Liberté, Égalité, Fraternité; it’s more of a written expression. You’ll find it on governmental letterhead and other official documents, stamped onto coins, and carved onto the pediments of public buildings. In 2007, presidential candidate Ségolène Royal’s linguistic invention (or gaffe, some say) bravitude inspired the derisory Libertude, égalitude, fraternitude. 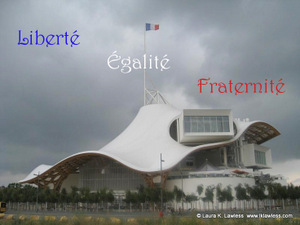 Wait, you forgot the most French thing of all – Liberté, Fraternité, Patienter ! Je vous remercie de tout mon coeur!